So... This is a post that I've been lining up for a few months now. Like I said at the beginning of the 30 day challenge, I don't just want to write purely on coaching and sport psychology. Though the blog is mainly about running and training, I want to cover my interests and those of the running community who tune in. I mostly know my UK audience personally through running clubs and races, but the stats for the blog show the largest readership is in Canada and the US, where my next guest is heading in the next few weeks for work. 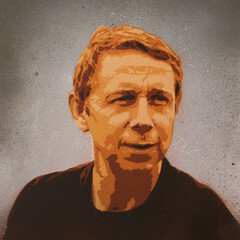 Having set up the Worldwide radio show, festival and website, Mr Gilles Peterson is a guest I've wanted to host on the blog for over a year. I want to explore some of the knowledge from sport psychology research on running and the effects of music, but also get expert opinion from elsewhere. In the past 10 years, a lot of musicians, DJs and artists have donned their trainers and pushed their physical endurance as evidenced by the success of groups like London's Run Dem Crew, New York's Bridge runners, and events such as Run to the Beat and The Rock and Roll series of half and full marathons. I was down in London for a few days and managed to grab an hour of Mr Peterson's time. Between presenting BBC 6 Music's Saturday afternoon show, DJ gigs and running the Brownswood collective, Gilles has slowly been feeding his running bug over the past 10 years. All after having the wake up call of his first proper hangover at 37! (how?) when he realised his body needed more care and attention than he was giving it. Having made the time to run, he admits he is now running "obsessed." I put it to him that the same level of obsession needed for record collecting, keeping to a hectic DJ schedule and pushing himself in the field of music has led to running being a natural hobby he'd end up participating in. He didn't disagree! So early today, I headed to the Brownswood offices where we talked for over an hour about running, France, psychology, and more. The edited highlights of the first part of the interview of how he started running and his experiences you'll find below. The rest of what we discussed I've put into a Q and A format for running and music devotees. Hope you enjoy. Good luck Gilles in getting towards that magic 4 hour marathon time! Juggling the conflicts of working in the music industry and running. Routes around London and what running does for relaxation and the mind. Q and A on running, music and endurance. Q. Do you run with music? GP: "No. It's my time off. My yoga, my meditation. Earl Zinger (my running buddy) calls round to get me out of my 'music world' to run and help chill me out." Q. How do you rank running your first Marathon? GP: "Best ever thing! Even better than having kids!" Q. How did you find the psychological part of running your first Marathon? GP: "Well it wasn't that bad! I can run about 14 or 15 miles without those (carbohydrate) gels. I was surprised. Of course it was mentally hard and tiring, but I didn't suffer that badly throughout. It helped that at the finish the last steward you see as you come round Buckingham Palace to the Mall recognised me and gave some encouragement to get to the line!" Q. Sport Psychologist Costas Karageorghis studies the effect of music on running and sport. He's found that if the amount of times your feet hit the ground during a minute running match a music selection you're listening to, with a rhythm that matches or is a few BPM above that number, your perception of effort is lowered. In theory, this then makes your mind feel less fatigued. But as each persons speed is unique, you need to program a playlist that matches your tempo. With this in mind QoolDJMarv from New York asks: "Have you ever thought of putting together running playlists for people?" GP: "Not till now. Wow! That's really interesting. Maybe? Personally, I reckon in the future we'll be able to run and just with the power of thought be able to call on music that is in the right tempo to the speed we're running along at. Though thats a long way off!" I've decided that when I run my next marathon, wherever I do it, whatever time I finish in, that night I'll DJ for that length of time. I was so hyper after London in 2010 I couldn't get to sleep!" Q. [Blatantly ripping off Marathon Talk - apologies guys!]. If you had 1 months full training, using a 400 metre track and going all out; how fast do you think you could run a mile in? GP: "Oof! What am I running now? Seven and a half? Eight minute miles? Maybe with proper coaching 6 minutes." Q. Favourite place to run abroad? GP: "Cuba. Havana is amazing. Not many runners. I get a few funny looks when I run there!" 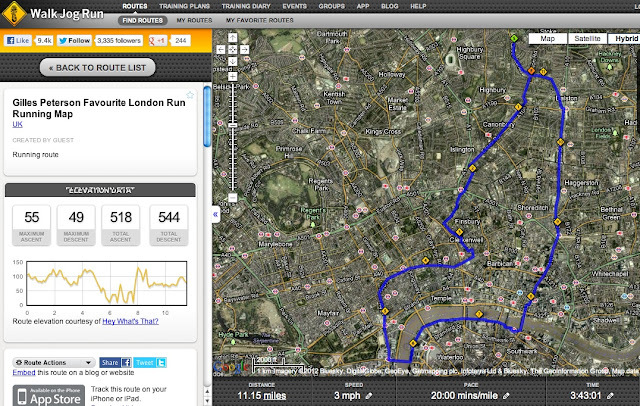 Q. Favourite run in London and what time of day? GP: "Well, I'm a better runner at night. Isn't everyone? Though I love running really early in the morning at 5/6 o'clock. My favourite long run is from Stokey, down the Essex road, through Islington, into Clerkenwell, past all the ravers leaving Fabric! into town, cross Westminster bridge, and along the embankment, past the Shard, up to Liverpool Street Station, up Kingsland Road, through Dalston, back home. London's such a good city for routes."